It is getting time to work on my goals. I do not call them resolutions. And I do them about 3-4 times per year. I like to work on 3-5 goals at a time. Each broken down with an action plan. One rule I have is - it cannot be on my list unless I am prepared to spend an hour per week on it. Of course for some, I spend way more than that. I have get goals - things I strive for. And stop goals (or reduce) - things I want to reduce. We do things if there is more pleasure associated with doing them than not. Or we do them if there is more pain caused by not doing them. The pain part is emphasized in martial arts training - a bit if pain can motivate change. So one trick is to add to the pleasure - EG - drink tea if I do do something or add to the pain - EG - not do something. You get the idea. I liked the quote because it is the behaviours that create the ultimate result. As I call them - Success Habits. A good video by Simon Sinek on managing Millennials. I generally dislike "labelling" a group and assuming they are all the same. That said, I have found good support of my Syrian project by my Millenial staff. It has become the Danby purpose. And it fits with "do the right thing" which is one of the things we emphasize at Danby. Speaking of Syrian project. We need lightly used sheets, towels and snow gear. We also need rugs. We need new pillows. Drop them off at Danby Guelph. This is the most adorable video of my grand daughter doing a work out video with her mother. 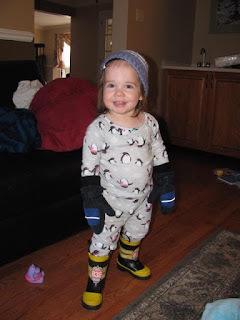 And another granddaughter accessorizing her PJs for winter (inside no less).